When Will I Get My Self-Seal Envelopes? 5,000 and under Self-Seal Envelopes: Ships or ready for pick up in 2 business days from proof approval. Over 5,000 Self-Seal Envelopes: Ships or ready for pick up in 5 business days from proof approval. Make life easier and save time with the onlineself-seal envelope printing services of 48HourPrint.com. Print with us and be confident you’re getting self-seal envelope printing. Our online envelope printing services include our industry-leading 48 Hour Turnaround Guarantee for quantities of 5,000 or fewer self-seal envelopes. Self-seal envelope printing makes sealing envelopes fast and so easy! No need to lick or moisten an envelope flap with self-seal envelopes - just peel off the adhesive covering and seal the envelope. Print your full-color logo and address on these envelopes for a truly professional look. Once you try self-seal envelope printing, you’ll never want to lick an envelope again! Our self-seal envelope printing services include #10 envelopes, #10 window envelopes, 9 x 12 envelopes, and 10 x 13 envelopes. 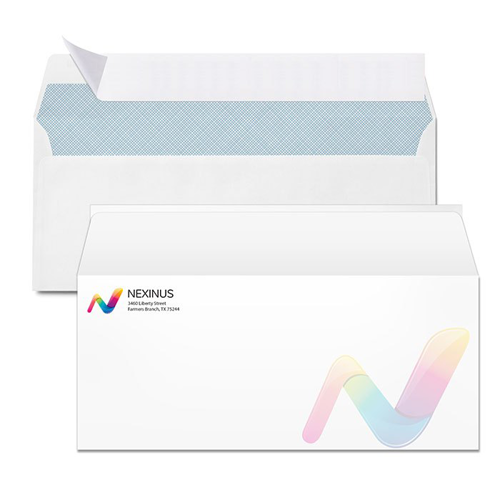 All of our envelopes are printed full color one side on laser and inkjet printer-compatible paper stock.